Download the Puna 'Ulu Festival poster. 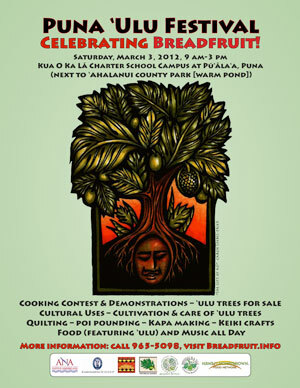 The Puna ‘Ulu Festival will be held on Saturday, March 3, 2012 from 9 am – 3 pm at Ho‘oulu Lāhui, the site of Kua O Ka Lā Public Charter School at Pū‘āla‘a, adjacent to the ‘Āhalanui County Park warm pond in Puna, Hawai'i Island. The event is free and open to the public. The Puna ‘Ulu Festival will feature a cooking contest, breadfruit trees for sale, presentations on the cultivation and care of ‘ulu trees, poi pounding, tapa making, activities for the keiki, music all day and local food featuring breadfruit. Without a landscape that was conducive to abundant taro production, Hawaiians in Puna relied heavily upon the breadfruit. Due to the young lava lands in Puna, the planting styles are different and the primary staple food for Native Hawaiians was always ‘ulu, not taro. Puna was uniquely known for its breadfruit trees that were planted in deep holes so that the leaves and fruits grew at ground level. Hence the breadfruit groves were often referred to as “hidden” because they couldn’t be seen from afar. Kua O Ka Lā Public Charter School (PCS) is located at Pū‘āla‘a in Puna, a 600-acre ancient Hawaiian village site. The revitalization of ‘ulu in this region is a key initiative for Ho‘oulu Lāhui and Kua O Ka Lā PCS. The day will include a Breadfruit Cooking Contest in which the public can enter recipes in the categories of Appetizer, Main Dish/Entrée and Dessert. Prizes will be awarded for 1st, 2nd and 3rd place in each of these categories and for Healthiest Choice and Best in Show. Breadfruit Cooking Contest rules and entry forms will be posted here by January 31. Cooking demonstrations will be held throughout the day featuring Chef Casey Halpern from Café Pesto, Shirley Kauhaihao, a Hawaiian cultural practitioner from Kona, and the students of Kua O Ka Lā PCS. There will be a locally sourced buffet lunch which features breadfruit and Kua O Ka Lā PCS students will be selling their award winning ‘Ulu Tamales. The Puna 'Ulu Festival will be held at the Kua O Ka La Public Charter School Campus at the historically significant village of Pu'ala'a near 'Ahalanui County Park warm pond. Cultural activities will be ongoing throughout the day including traditional ‘ulu poi pounding, making poi boards from ‘ulu wood, tapa from ‘ulu bark and Hawaiian quilting. Keiki activities include games and an art booth with local artists. Uncle Keikialoha Keikipi will be planting an ‘ulu tree to commemorate the 10-year anniversary of Kua O Ka Lā PCS. Show aloha--this is an alcohol-free and drug-free event. No coolers, mahalo. The Puna ‘Ulu Festival is sponsored by Ho‘oulu Lāhui, Kua O Ka Lā Public Charter School, Hawai‘i Homegrown Food Network, the Breadfruit Institute of the National Tropical Botanical Garden and Kamehameha Schools. The Puna ‘Ulu Festival is a part of a larger statewide effort to revitalize breadfruit for food security called Ho‘oulu ka ‘Ulu. 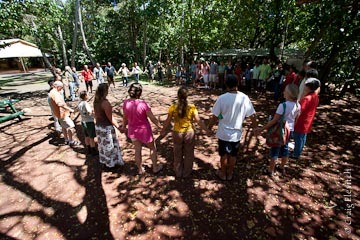 Learn more about the Puna ‘Ulu Festival by visiting www.breadfruit.info or call 965-5098.